A spectrum analyzer is a plug-in that lets you monitor the spectral content of audio signals in real-time. This can come in very handy if you can’t detect frequencies by ear alone. It’s a great analyzer, you have an average length control (response) which allows you to slow down the display refresh to really see what’s going on with a track or mix. Recently I was mixing a Rap track and the female vocal had a harshness to the tone. I was struggling to find the exact frequency causing the issue. My solution to this was to strap Manalyzer onto the vocal tracks input and monitor all the frequencies. I found it fairly easily by adjusting the average length control until I was getting a display on the frequencies moving in real-time. I found the frequency, reached for my EQ and attenuated that frequency a few db. Another use is when you have your mix done and levels, EQ and compression complete but need to find where the mix is heavy on frequencies. Say you have some real bottom end issues when the mixdown someone sent you for mastering. You can’t go into the session and EQ a specific track because it’s just a stereo mixdown. 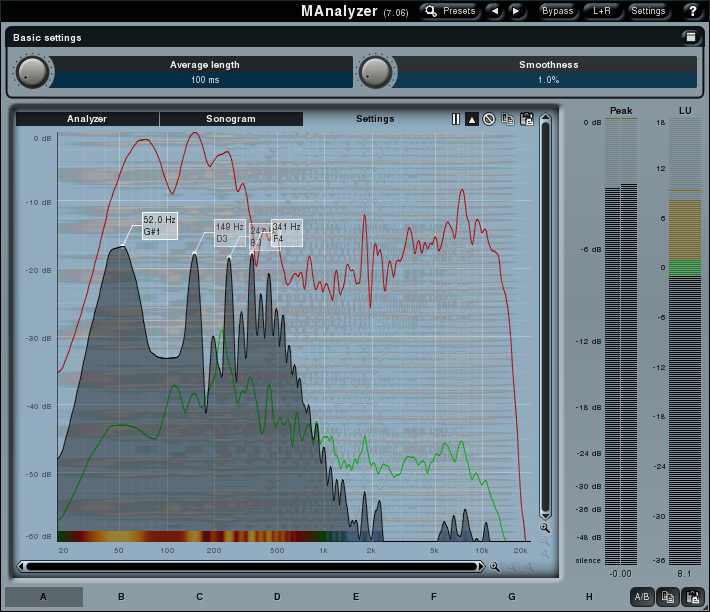 You could strap Manalyzer onto the Master bus see the track in real-time and where it is heavy on lower frequencies. Now you can EQ via the Master bus or use a multi-band compressor to fix what you need to before the mastering phase or even as part of it.